I felt very welcomed. They took care of the problems that were on my computer and it seems to run faster and pop ups are gone. I would be willing to come back and recommend them to others. We fix many business related systems and software installs, you can count on us to get your business back up and running! We're dedicated to providing the best pc repair with great customer service at an affordable price. Do you need quick pc tech assistance? Go to our instant support page for immediate help! We repair almost anything computer related including computers, laptops and notebooks(Windows and Macintosh based), cell phones, tablets, surveillance DVR's and much more. 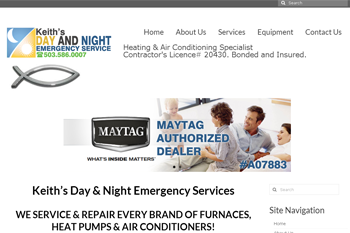 We also build and maintain websites and give education concerning websites and/or other computer related industries. 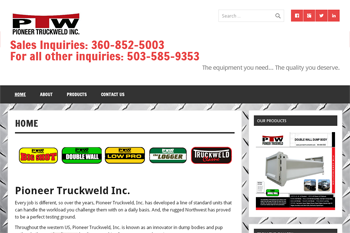 You can learn more about our company and its values over at our about us page. Don't get geeked: Why pay hourly? We only charge flat rates so no matter the problem BIG or SMALL you pay one price for our labor. For more information about our pricing check out our rates page. 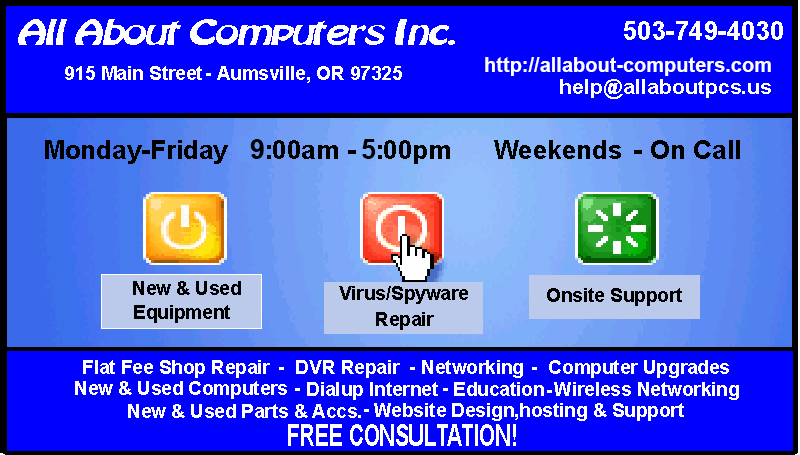 All About Computers in Aumsville, Oregon, is really Awesome! I normally drive clear into Salem to have my computer worked on for twice the cost. Lucky for me my normal PC Doctor was on vacation, so I went to All About Computers on the recommendation of a friend. I have Windows 8 and could not get past my splash screen, Not only were they able to fix my computer for like $85.00, (40.00 less expensive than the other places minimum) They got rid of the hated windows 8 format!! All I did was mention that I did not like it, when I got home, surprise!!!!! I still have windows 8, but they made it look and act like my beloved Windows 7! Thanks Guys! That was the best surprise I have ever had! I am very happy with their professionalism and their knowledge, I would trust them to work on my computer again, and they are very close to home. Our trained professionals can have your pc running smooth in no time and the best part is you don’t even have to leave the comfort of your home. With our instant support we can clean your pc of viruses, spyware, adware, popups, junk, temp files, and more all from a remote location. Looking for a new computer? We offer many different builds and work with our customer’s one on one to ensure their new pc meets their needs. 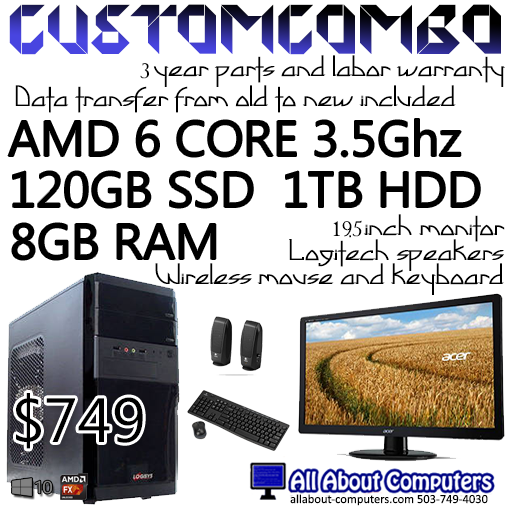 We also offer 3 year parts and labor warranties on all new computers. 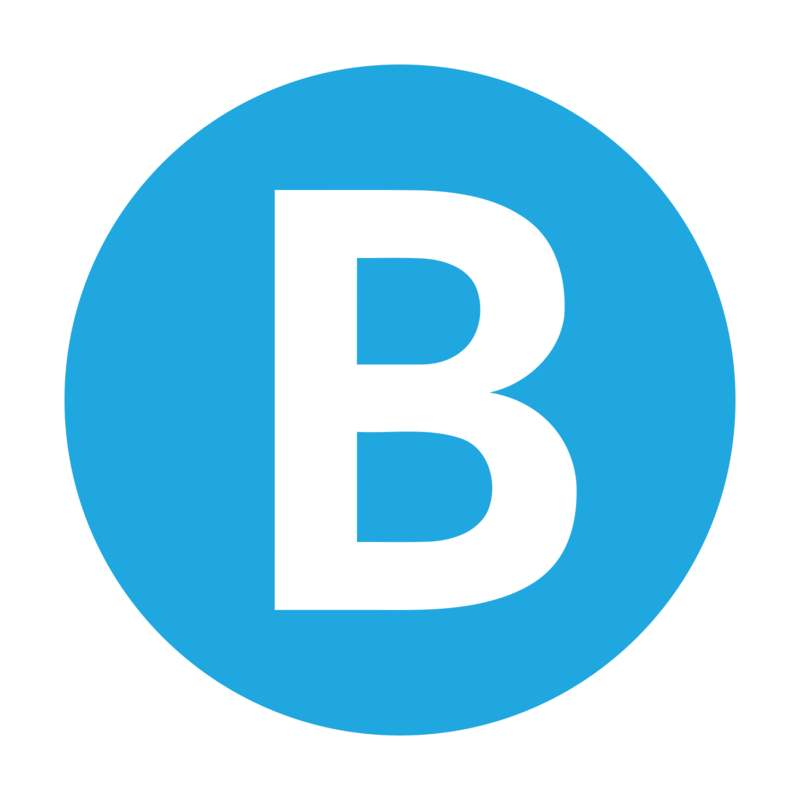 Check out our computers page to see what’s available. Is your business in need of tech support? We fix many business related systems and software installs, you can count on us to get your business back up running! In need of a support plan? We can help you with this as well! We already support many businesses in networking and more. We also fix broken mobile phones! 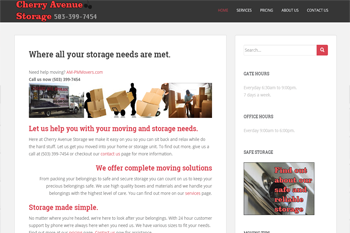 Responsive Web Design, Graphics Design, Hosting & More. Starting as low as $250 per website. Click the images below to find out more. That's right. If you can find a PC repair shop cheaper than us, we'll beat their prices! For additional promotional details head over to our rates page. Custom Computers Starting at $499.99 or Lower! Click the facebook icon and add us on facebook to stay up to date on security updates and other information from the tech world.